The facets are the small, bony joints that connect the spine’s vertebrae. Each vertebral segment has two facet joints, one on each side. The lumbar facet joints guide motion in the lower back. These joints provide stability and control but also allow for motion in the spine, so that you can bend and twist. Just as a joint in your finger, knee, or hip can cause you discomfort, so can the facet joints in your neck and back. They can become arthritic or injured, causing pain. 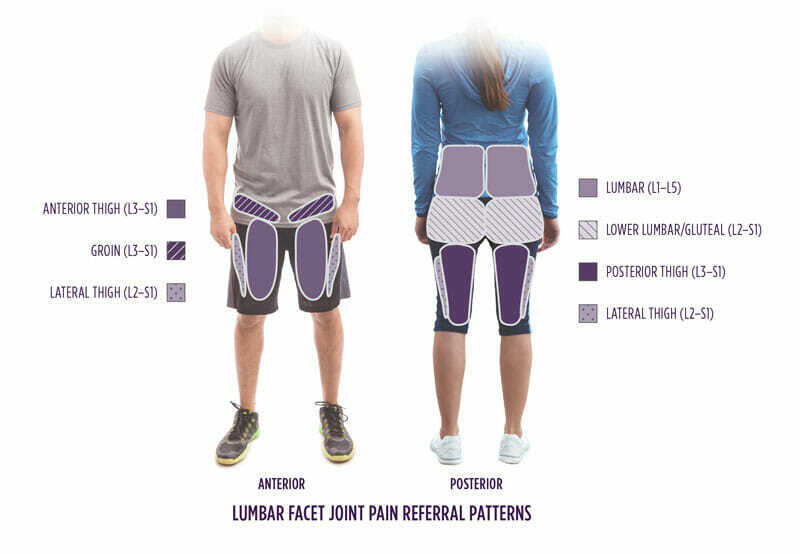 Pain that is mostly in the back and with a less specific, vague aching in the legs (one or both) may be coming from one or more of these small joints in the lumbar (lower back) area. The goal of facet joint injections is to decrease pain and inflammation in the facet joints by injecting a steroid (a strong anti-inflammatory medicine) into the joint. You will lie face down, with a pillow underneath your abdomen. The injection area will be cleaned and numbed before the injection. Using fluoroscopic (X-ray) guidance, your physician will identify the facet joints that should be injected. Your doctor will insert a thin needle into the back section of the facet joint. Next, your doctor will inject a small amount of contrast dye to make sure that the medication will flow exactly where it needs to go. Then, your physician will inject a small amount of steroid solution. After the procedure, you’ll spend 20 to 30 minutes in the recovery area. The steroid usually starts to work two days to two weeks after the injection. The pain relief varies for each individual, from no relief to long-term pain relief. Patients can have up to four steroid injections per year, depending on their other health problems or steroid injections into different areas of the body. While the procedure may take less than 30 minutes, you should allow for at least one hour at the procedure center. You need to arrange for a driver to be present and take you to and from the medical facility. If you do not have a driver with you, we may have to reschedule your procedure. Plan to rest for the remainder of the day. You may resume light activity that is comfortable for you, but do not overexert yourself the first day. For discomfort, apply ice packs to the injection site for 15 minutes several times a day. Do not soak in a tub for 24 hours after the procedure. You may take showers. Keep a record of your pain and symptoms after the injection and report your results as instructed by your doctor’s patient care coordinator. Remember that your usual pain may go away for a few hours, but after the local anesthetic wears off, it is normal for your pain to return. The full effects of the steroid may take two days to two weeks to work, and its lasting effects vary from person to person. You may also have some temporary discomfort at the puncture site. Nothing by mouth, including throat lozenges, mints, and all hard candy for two hours before your procedure. You must have a responsible adult arrive with you to our facility. If you use a taxi or volunteer ride service, you still must have a responsible adult with you in order to help take care of you after your procedure. How Long Does a Cortisone Shot Last? Learn about the factors affecting how long cortisone shot pain relief lasts. How Do Cortisone Shots Work? Learn about how cortisone shots provide pain relief. A nerve block can treat severe joint pain or arthritic conditions, and improve quality of life. If you and your physician decide that this is the right treatment for you, we tell you what to expect.